It has been 6 months since my last post. Six months! I cannot believe how fast time is passing. I have cooked along with the group on and off behind the scenes these past months. I’m not sure what happened… I think it all started when the kids made fun of my habit to avoid phone and computer updates. I succumbed to kid pressure and updated my phone but then it no longer wanted to get along with my computer. I have 6 months of photos that need downloading. The kids think my problem is with the Cloud but I don’t understand it. It reminds of me being in Chemistry classes and the teacher talking about molecules and… stuff. I can’t see it, so I just don’t get it. I have missed being part of my cooking groups! I love that it means I cook things I might never get to, like this onion tart or Pissaladiere! My photos are not the best but I found a way to get them up on my blog so I am happy for now! 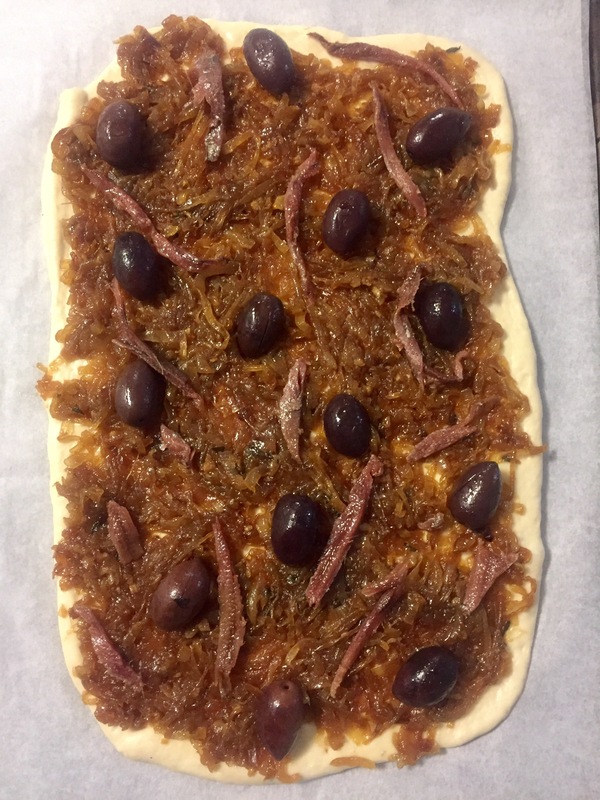 I loved the contrast of the sweet onions with the salty olives. I used Kalamata olives, but we take our olives seriously in this house and I have a particular store I go to that I know sells the best Kalamata olives so I stuck with what I knew. What really surprised me is how much the kids enjoyed this tart. 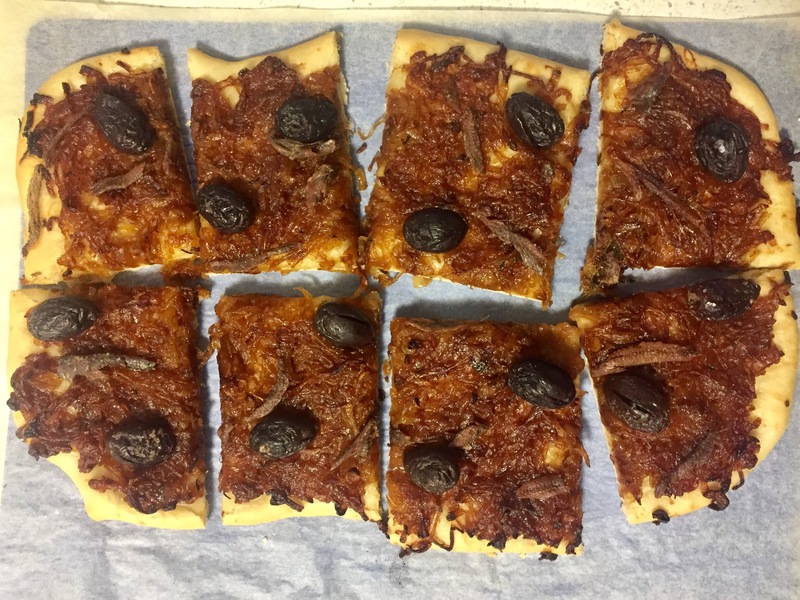 And not one complaint about the anchovies! I’m a bit rusty when it comes to posting online and I’m trying to not get distracted by an episode of Longmire on Netflix that my husband has playing in the background! But gee I’m glad to be back and cooking with the Cook The Book Fridays group! I can’t wait to have a read and see what everyone else thought of this recipe. Tags: baking, ccokthebookfridays, cooking, david lebovitz, food, onions, reviews, tarts | Permalink. Who would have thought cauliflower could taste so morish?! When I first explained to my 3 children (and husband) what we were having for dinner they screwed up their faces. Thank goodness for the Cook the Book Fridays group! Once I explained the Dukkah Roasted Cauliflower was the recipe of the week they were still skeptical however they take their food taste tester jobs seriously, so they approached the dinner table with an open mind… kind of. I threw in some carrots to the recipe for colour and served this along side grilled scotch fillet steaks. I’m not big on red meat so I was worried about the meal being bland however the Dukkah had more than enough flavour to carry it. It was a satisfying and healthy meal that packed some punch! (I didn’t even need the usual sauce I slather my red meat in so I can eat it). My 8 year old was the hardest to sell on the carrots and cauliflower, picking up the first floret with so much hesitation and suspicion I was prepared for his usual reaction. Wrapping his hands around his throat, then his stomach while his declaring he just can’t eat it ok? He just can’t! I was watching him out of the side of my eye, not risking drawing his attention. If he sees me watching, he thinks he has an audience and the theatrics begin before the food goes anywhere near his mouth! Seeing me busy and not paying attention (on the outside) and watching the older two start eating I saw him put a cauliflower in his mouth. Pause. Chew a little. Then as he chewed a little more, his screwed up little face started to relax. He picked up another bit of cauliflower and then a carrot and in the end he asked for more vegetables and left most of the meat on his plate. We have a winner! Yes! The dukkah I made had to be nut free as my 8yr old is anaphylactic to some nuts. He eats Nutella without problems and it’s made with hazelnuts however I didn’t want to take a risk so I substituted the hazelnuts in this recipe with sunflower seeds. I’ve always avoided dukkah because of the nuts, it was great to make my own and know exactly what went into it. I think the nuts would have smelled and tasted amazing, especially coming out of the oven! I don’t think mine smelled as amazing as David Lebovitz described in his book, My Paris Kitchen, but it wasn’t far behind! I am looking forward to reading what the rest of the Cook the Book Fridays group thought! Tags: baking, cook the book fridays, cooking, david lebovitz, dukkah, food, vegetables, vegetarian | Permalink.